The hike through Gifford Canyon is a nice stroll through a sandy wash. If there is water running it is especially charming. This hike gets you away from the crowds and into a secluded and beautiful area of Zion National Park. Difficulty: This is considered a moderate hike because it is off trail, but the exertion is easy and there is little elevation change along this path. Trail Conditions: This is not a trail, but a route through Gifford Canyon. Most of the path is rock and sand. Trail Access: The Zion-Mt. Carmel Hwy is open year-round and the route begins just off the highway. Off the Beaten Path: Yes, but the trailhead area can get hectic. Best Season: March to October, but can be hiked year-round if weather cooperates. Park in the lot located immediately east of the Zion-Mt. Carmel Tunnel. Locate the restroom that is sitting at the back of the parking lot and look for the trail of use, seen to the backside of the restrooms. 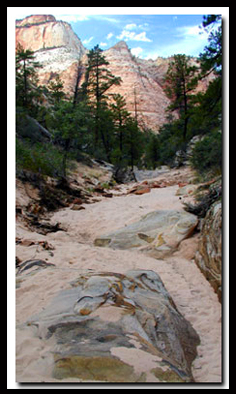 Climb down the steep sandy path and enter the Pine Creek slot. Do not get too mesmerized by the slot canyon going to the right (Pine Creek) and to the left (Clear Creek) since these are separate hikes. Hike upstream for about 75'. This is not a trail and it is not an obvious direction to travel. Look for a 15' wall of slickrock. You can scramble up the rock or look for the beaten path on the backside of the rock. On top of this wall the path is a narrow dirt path of use that is crowded by rock and vegetation. It winds around the mountain to an area where the path widens. To the right is a dead-end with a beautiful view of the mountain where the Canyon Overlook Trail is located. The other direction is Gifford Canyon. Soon the path will lead past a broken stone bridge and then to another minor slickrock climb. The next mile is a sandy path with a few stones here and there and vegetation along the sides. Evidence of flash flooding is found in many places along the path. Vegetation includes some hanging gardens, ferns, pines, scarlet gila, manzanita, cottonwoods and bright yellow primrose. Towering cliffs crowd close to the walking path. At the end of the canyon there is a circle of cliffs preventing further exploration without climbing up the sandstone. To the left is an uneven blind arch and to the right is a water polished carved slab of rock. The strenuous and technical trail to Bridge Mountain climbs up the slickrock about halfway through Gifford Canyon. Clear Creek is to the left before climbing up the 15' slab at the start of the hike. The technical slot, Pine Creek is to the right. Access without getting on the Zion Canyon shuttle is always nice since you have access to your ice chest, food, a place to rest, and so on. This is a quite path leading to solitude away from the crowds, however the trailhead can be congested and parking can be difficult because the parking is shared with Shelf Canyon and the Canyon Overlook Trail as well as the technical slot canyon Pine Creek. Note: Check the weather report before hiking this canyon. There is a danger of flash floods. Gifford Canyon is a storybook-like walk through a hidden canyon on the east side of Zion National park, entombed by towering monoliths and beautiful mountains. Few find this hidden oasis, so it might be yours alone to enjoy.